David Morris: Pink pearls are rarely found larger than the size of a Tic Tac, so it’s a real sweet sensation, that London jeweller David Morris has amassed a larger-than-life selection of the rare gems for its latest high jewellery collection. 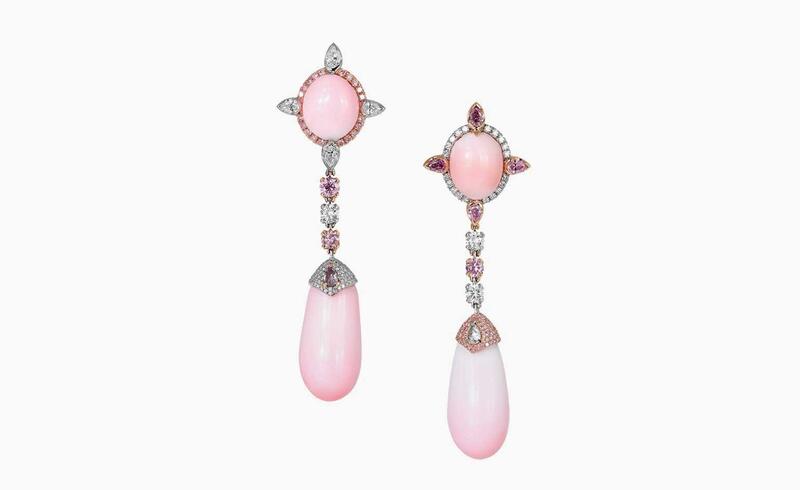 These earrings feature four candy floss hued pearls sourced in the Caribbean, and their beauty lies in the asymmetry in both their colour and shape. This off-kilter elegance is emphasised in the wider design of the earrings, which are set with asymmetrically coloured diamonds. From ice-blue to sunset orange, coloured stones have been a signature of David Morris since it launched in 1962. Blush-pink is particularly synonymous with the house, and the purple diamonds, rose gold and sugary pink pearls in these earrings emulate its coveted softly romantic colour palette. 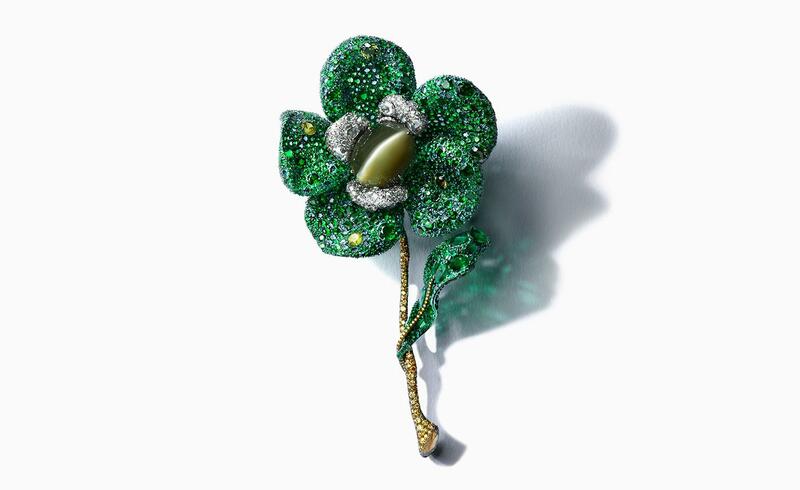 Cindy Chao’s ‘Greenovia Brooch’: With the festive season in full swing, we’ve fallen for the sparkling green tones in Taiwanese jeweller Cindy Chao’s‘Greenovia Brooch’. The piece is formed from almost 2500 green gemstones which form different verdant gradations of colour across its curving petals and stem. The varying sizes of the stones give the piece a naturalistic flair, one enhanced by the creamy 105-ct Chrysoberyl Cat’s Eye in the flower’s centre. Mikimoto ‘Jeux de Rubans’: Japanese pearl specialist Mikimoto has honed in on a particularly feminine motif for its new high jewellery collection. Named ‘Jeux de Rubans’, it sees the house’s trademark lustrous pearls translated into twisting bows and ribbons. In one necklace, cultured Akoya pearls appear meticulously gathered into a lace-like ruff, cinched around the neck by a thin diamond-set chain that appears to fall into a draping bow. 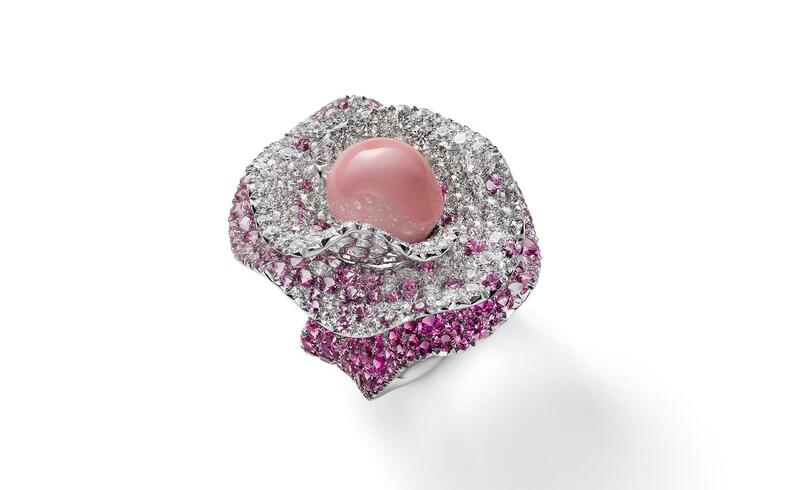 But it was Mikimoto’s sculptural diamond and pink sapphire ring that really caught our eye: it billows off the finger like an unwinding spool of satin, with a rare, creamy-pink conch pearl resting in the middle.